Malaysia' capital city is a very much overlooked gastronomical wonderland. It always frustrates me to see most tourists and backpackers treat it purely as a layover between two Air Asia flights. It's honestly one of my favourite cities to wander around and stuff myself silly. Why? Because of the diversity and high food quality. 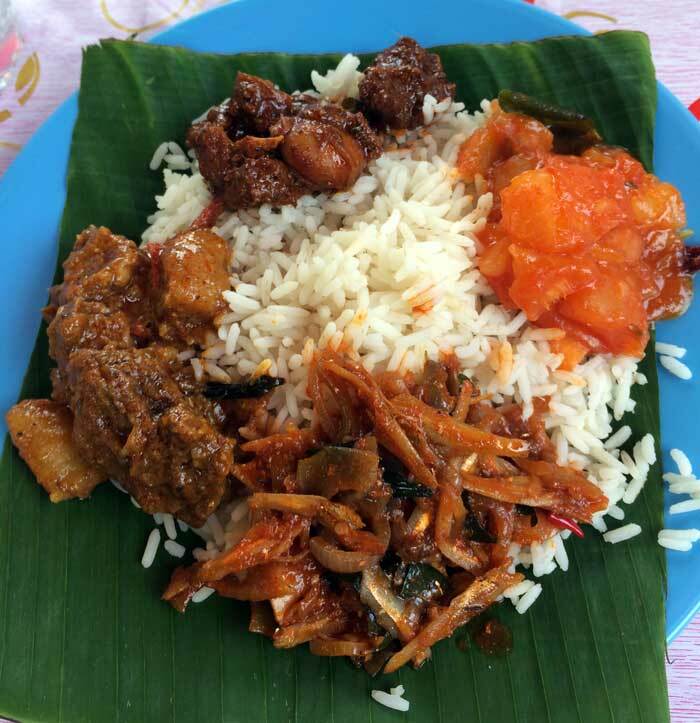 Malaysia is a melting pot of three cultures that all take food very seriously; South East Asian, Chinese, and Indian. 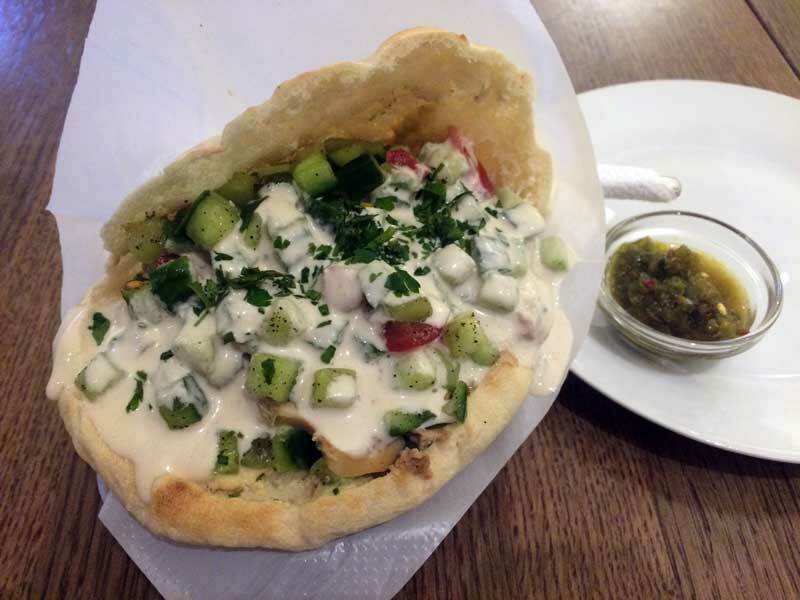 It's the only place in the world that combines these three cultures to such a degree, and the result is mind-blowingly tasty. Kuala Lumpur is the centre of this diversity, and is where this Malaysian fusion collides with influences from Western countries. Whereas Penang is the best for Chinese-Hokkien inspired dishes, and the East Coast and Borneo for more traditional Malay dishes, KL is where it all collides. 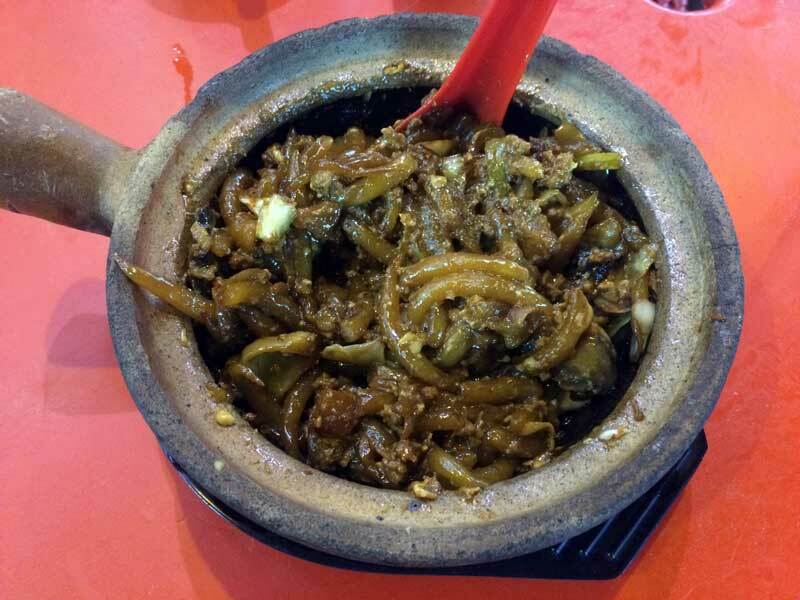 This dish is deliciously referred to as claypot rat powder. Uh... What? I'm not sure how it got its name, but it's very tasty and rather unique to KL despite the name. It's essentially thick, creamy noodles cooked in a soy sauce with meat, carrot, garlic, shallots, stock, and topped with a raw egg. When served, the claypot is still piping hot. You stir the raw egg into the noodles right away, partly to cook it and partly to keep the noodles from burning to the sides of the pot. It's a creamy, rich meal with surprise pieces of divine pork crackling to blow your mind. 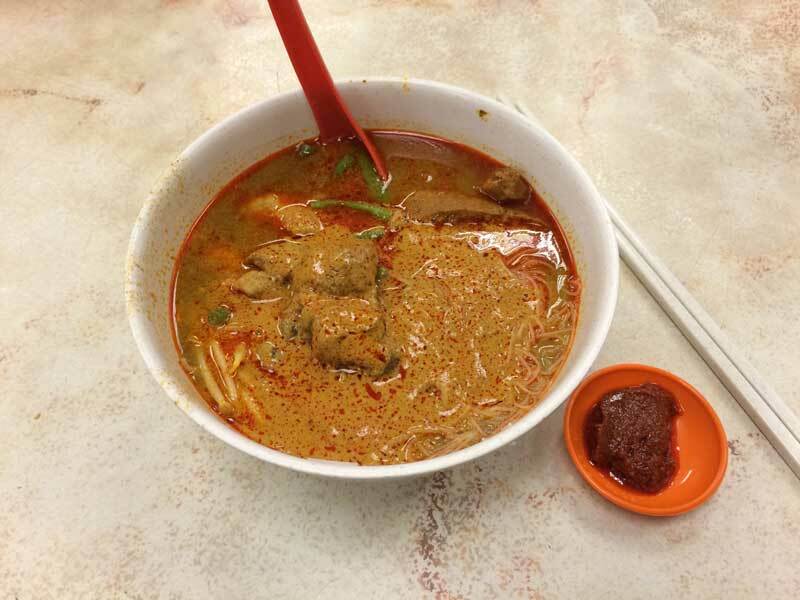 Get it during the day at the legendary Restoran Seng Kee, or if that fails, at the highly reliable Kim Lian Kee (mentioned several times in this article). Dim Sum is a long-standing Chinese tradition of steam-cooked foods, and KL is a hot bed of amazing dim sum action. The choices that come from dim sum are as varied as they are delicious. Extremely. Whether it's for grab-and-go buns of savoury BBQ pork, sweet red bean paste and lotus seed, all the way to the colourful array of pork-stuffed dumplings. You can find the big buns in steamers across the city, but my favourite is at Kim Lian Kee in Chinatown. 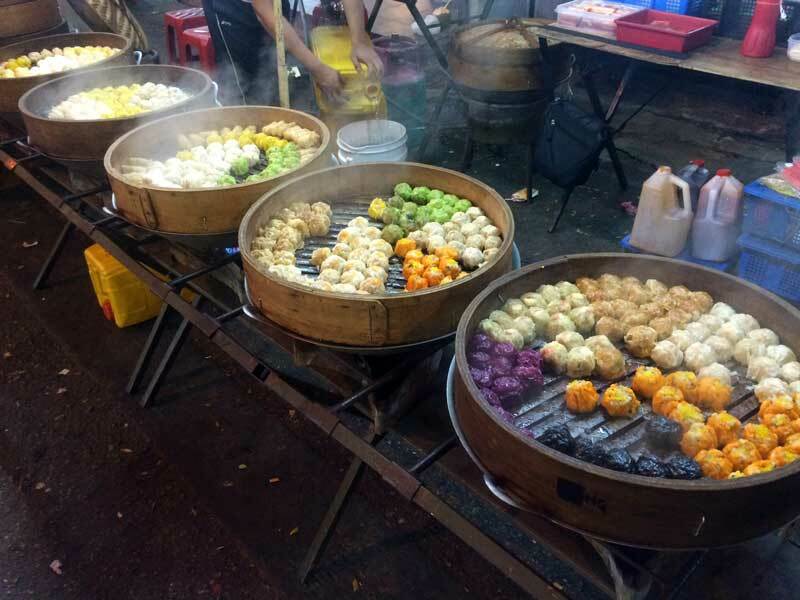 For the colourful dumplings, I hit up the guy on Jalan Alor at the night market. But you'll find dim sum at nearly every Chinese restaurant. One of my greatest guilty pleasures is a Big Pork Bun, a gigantic steamed bun filled with succulent BBQ pork, chicken, duck egg, and maybe some mushroom. It's larger than my fist, fills me up for lunch, and costs a mere 3.80 RM. 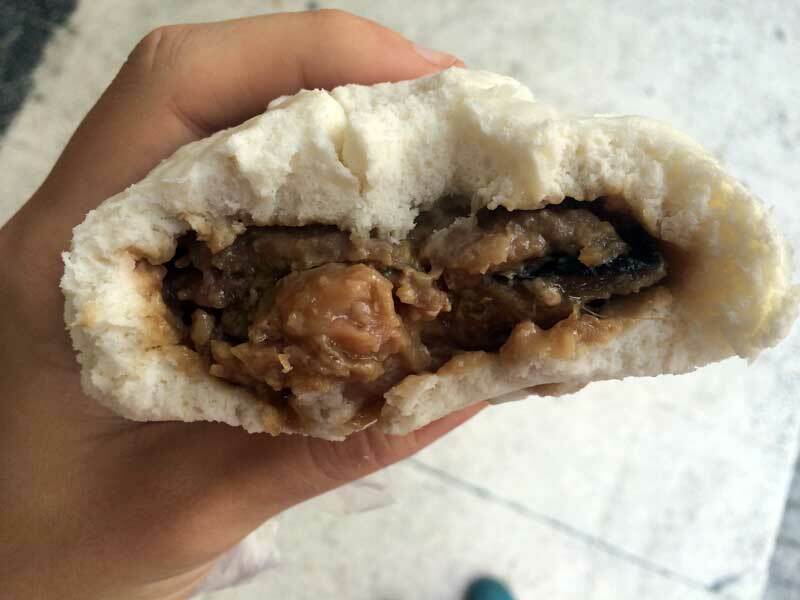 Nothing is more heavenly then a perfect mouthful of slightly-sweet bun saturated in pork juice and a slice of the pork itself. Yong Tao Foo is yet another Chinese tradition that terrifies Westerners away from ever trying it. A typical stand will have a dizzying array of unidentifiable skewers. These are predominately different tofus and vegetables, either left plain, or stuffed with meat and fish paste. Simply point a bunch of them out, and they'll serve them to you with a dipping sauce, or they'll throw them all together and create a noodle soup out of them. They're actually really tasty, and there's a near endless supply of different things to try. Be brave and go for it. You can find Yong Tao Foo all over the place at night, particularly in Chinatown. Another local Chinese dish with an incredibly appetizing name, meat bone tea. Although not pretty, it is extremely accurate. Essentially you take a highly spiced broth (cinnamon & anise) with a bunch of oil in it and slowly cook fatty cuts of pork for hours and hours until it's incredibly smooth. They also throw some thin mushrooms and lettuce in the broth and then serve it with sides of rice and bean curd. At least that's the classic version, as you can also get it with different spices and meats. 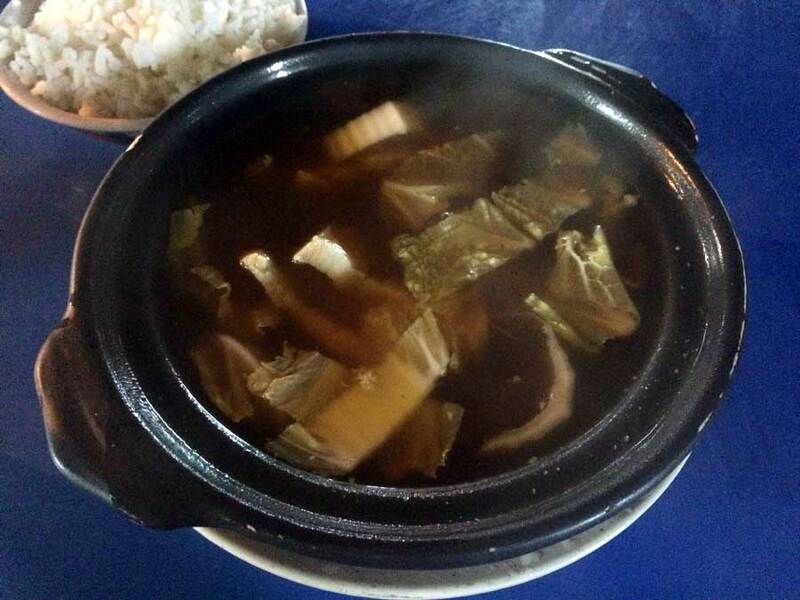 Find it in Chinatown on Jalan Sultan at a couple street food stalls and restaurants advertising Bak Kut Teh. I have no personal favourite. 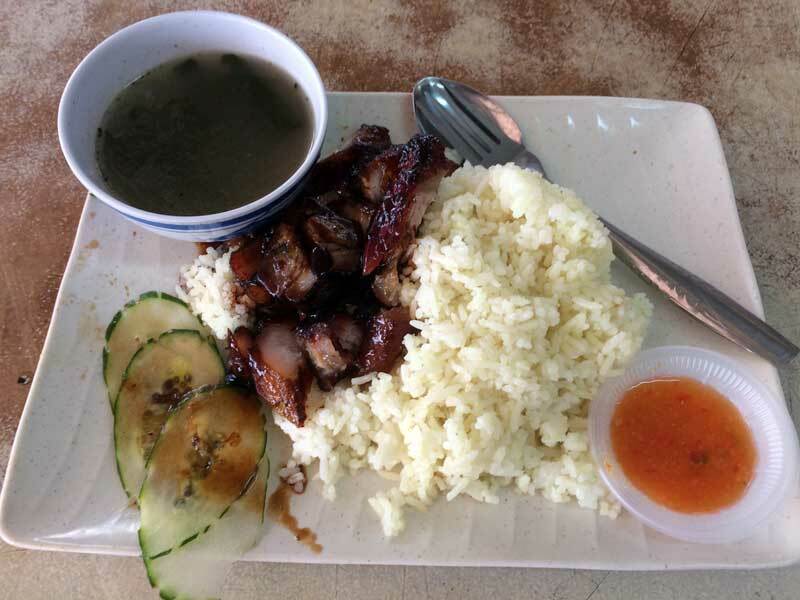 Hokkien Chicken/Duck Rice and Char Siew (honey roasted pork) are some of the greatest testaments to meat out there, and are a longstanding lunch-time tradition. You won't be able to wander anywhere in KL at lunchtime without seeing dark coloured, whole chickens and ducks, and big long strips of pork hanging from small carts. Ask for an order and they'll take one down, roughly chop it up with a butcher's clever and throw it on a plate. All three dishes come with a ladleful of lovely slightly sweet dark sauce, chilly sauce, a soup, some token pieces of veg, and chicken-flavoured rice. Yes, that's right. The rice is cooked in chicken broth and fat, giving it a lovely hint of the chicken you eat it with. All the cuts are very fatty and cooked a little crispy. Nothing is more blissful then a perfect fork full of crispy meat, sweat sauce, and chicken rice. When it's crispy and combined with the sauce it's divine. My go-to place was a small place off of Jalan Alor on Tengkat Tong Shin called YW Coffee Shop. It ain't open for dinner, so go during the day. Yeah, this Curry Loksa looks amazing. It is. Curry Loksa/Mee is easily one of my favourite Chinese-Malay dishes. A lunch or dinner egg noodle soup in a broth absolutely loaded with a thick, red curry paste and loaded with clams, chicken, tofu, and some token Chinese vegetables. The spice level won't blow your head off, but it adds a nice heat, thickness, and a delightful curry flavour. The crunchy tofu also adds an extra dimension of texture. If the soup isn't hot enough, well luckily they give you a side dish of sambal to load up and make it hotter. I warn against this, however, because the sambal will retract from the much better flavour of the curry paste. My favourite places were either another tiny place on Tengkat Tong Shin called Restoran Kam Fatt (good dim sum too), or Blue Boy if I felt like the equally delicious vegetarian version. Pan Mee ("flat flour noodle") is another Chinese noodle dish, but this time it's actually quite unique to Kuala Lumpur. The noodles are hand-spun and have a slightly gnarled appearance, but are truly delicious due to their freshness. 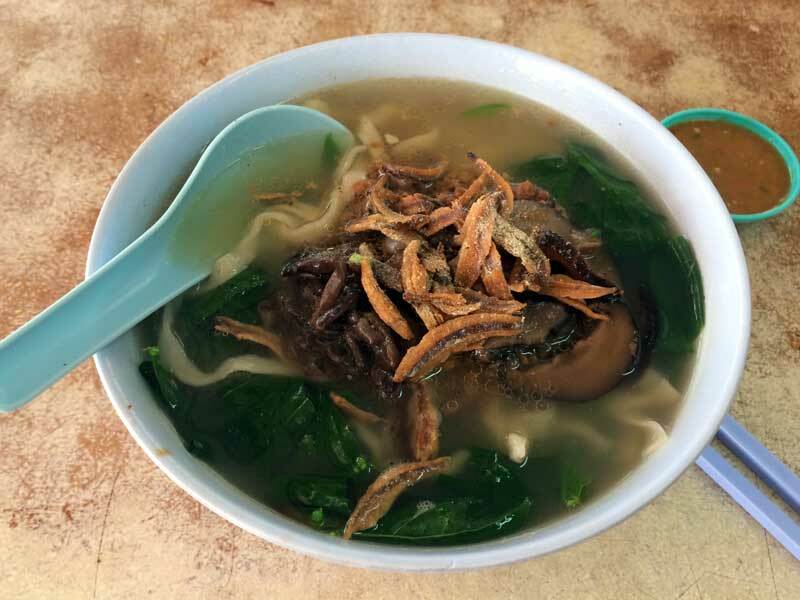 Pan Mee is normally served as a soup with minced pork, mushrooms, fried anchovies, and some sort of leafy vegetable. Other variations add a spicy curry broth, pork belly, or fried the noodles in a pan and leave out the soup broth all together. It's a good option if you like anchovies and mushrooms, but it personally wasn't my favourite noodle dish. You can find it at the other restaurants I listed on Tengkat Tong Shin, or in Chinatown. A delicious Roti Sardin, containing sardines minced up with vegetables and spices. Dip in a lentil or fish curry. In Malaysia, roti is life. I don't think any other food is eaten more often than the simple roti. A roti is a flaky, Indian flatbread cooked on an oily stovetop until golden brown, and served with a lentil, chicken, or fish curry. Simply rip it apart, dip it in the curry, devour, and repeat. There you've got yourself a breakfast, lunch, dinner, or even a mid-day or midnight snack. Rotis are incredibly versatile and come in overwhelming variety from those stuffed with egg, meat, sardines, or jam-packed with margarine, banana, or hot chocolate powder. You'll find them at nearly any non-Chinese restaurant in KL, and they'll range from 1.2-10 RM depending on the complexity. 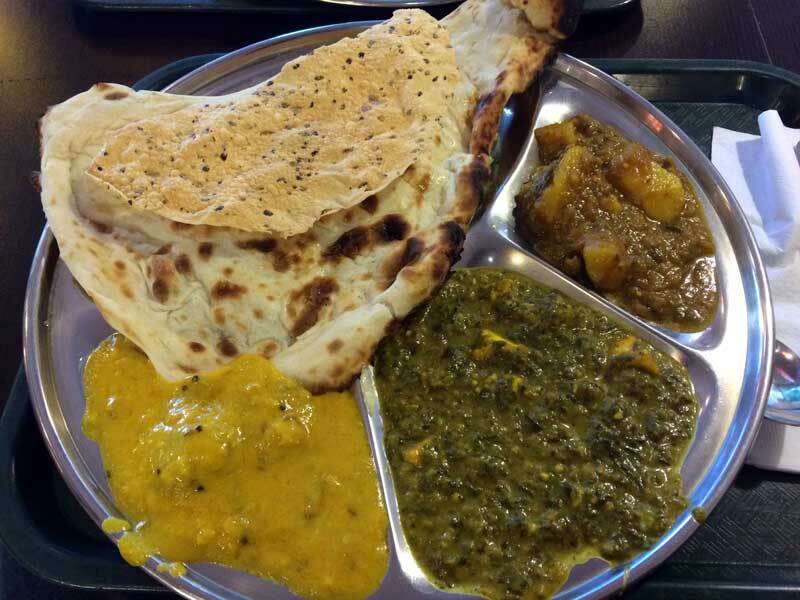 Making a choice can be a bit overwhelming, so for a full, described list of all the lovely roti delights you can find in KL, check out my other article, The Rotis of Malaysia. Roti Babi (pig bread) is truly unique to Kuala Lumpur, and is actually the only roti that is of Chinese origin. From the name you'd probably assume it was some other variation of Indian flatbread, but you'd be quite wrong. 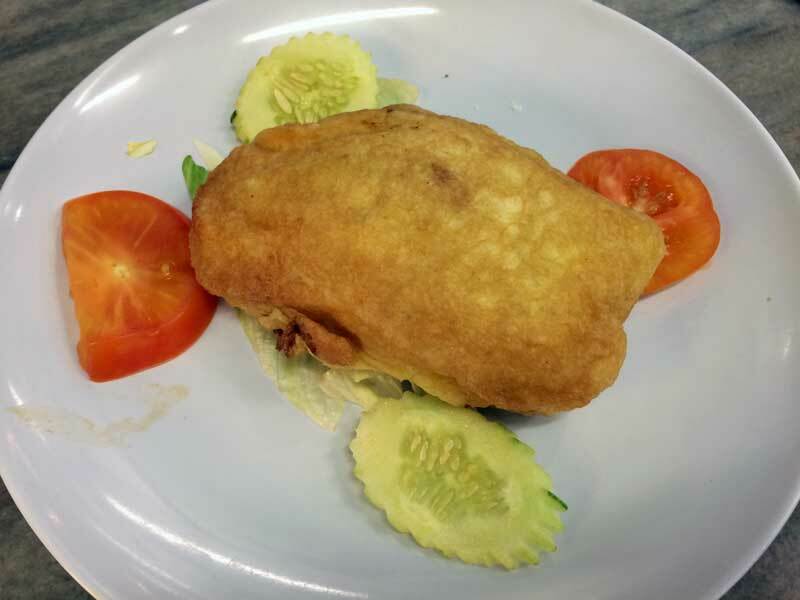 It's a hollowed out bread roll that's been stuffed with minced pork and vegetables, and then deep-fried. Okay it's not the healthiest of meals, but at least it comes with some fresh tomato, cucumber, and salad. It's really just a speciality of one particular restaurant in the Western part of the city (still an easy walk from Chinatown), called Yut Kee Restaurant. Walk over and enjoy a roti babi with the slough of other intriguing Chinese-Malay dishes on offer. If you've had Hokkien Mee outside of Kuala Lumpur, don't make the mistake of thinking you've already tried it. Hokkien Mee is prepared quite differently in Penang, KL, and the rest of Malaysia. 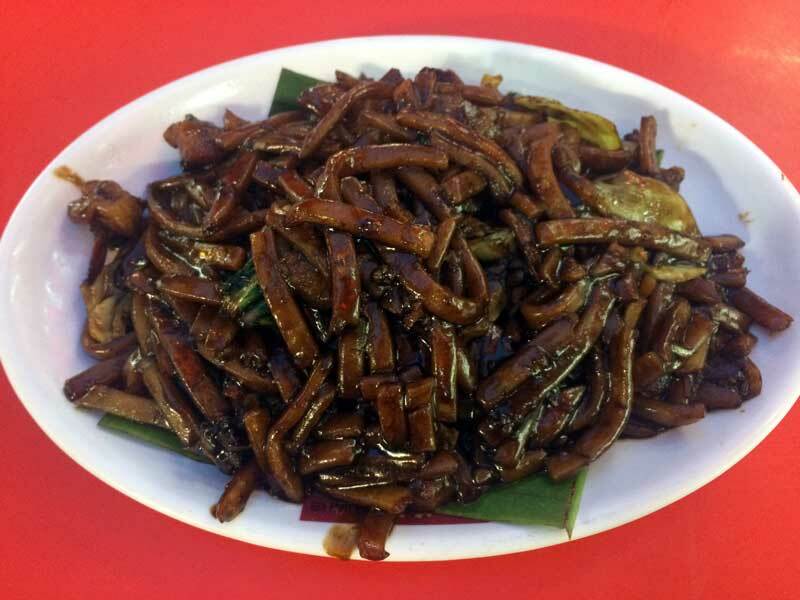 The KL version is dry, aka not a soup, dish with thick noodles stir-fried in a thick, black sauce and loaded with pork, and baby squid and shrimp. The key, taste-bud-shattering ingredient, however, is the crackling pork, giving the dish an amazing salty and smoky flavour. The best place in town, famed for its continued use of charcoals to char to noodles is Kim Lian Kee in the heart of Chinatown. Damn it's good. No food list for Malaysia is complete without Nasi Lemak, Malaysia's national dish. 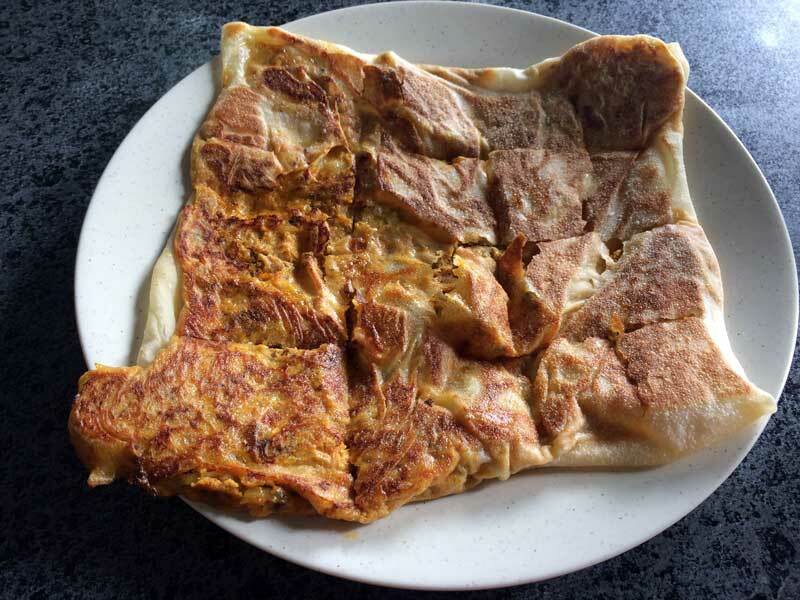 Although it's not necessarily the dish that's consumed most often (that goes to roti), it's still quite common, and is truly unique to Malaysia. Nasi lemak translates directly to "fat rice," aptly named as the rice is cooked in coconut milk, giving it a smooth texture with a cooling sensation. The basic nasi lemak is paired with sambal, a spicy chili chutney, and either an egg, some anchovies, or both. Wrap that in a banana leaf and sell it at a stall or corner store for ~1.40 RM and you've got yourself a breakfast. Fancier versions add roasted peanuts, cucumber, and maybe even a piece of chicken (nasi lemak ayam). 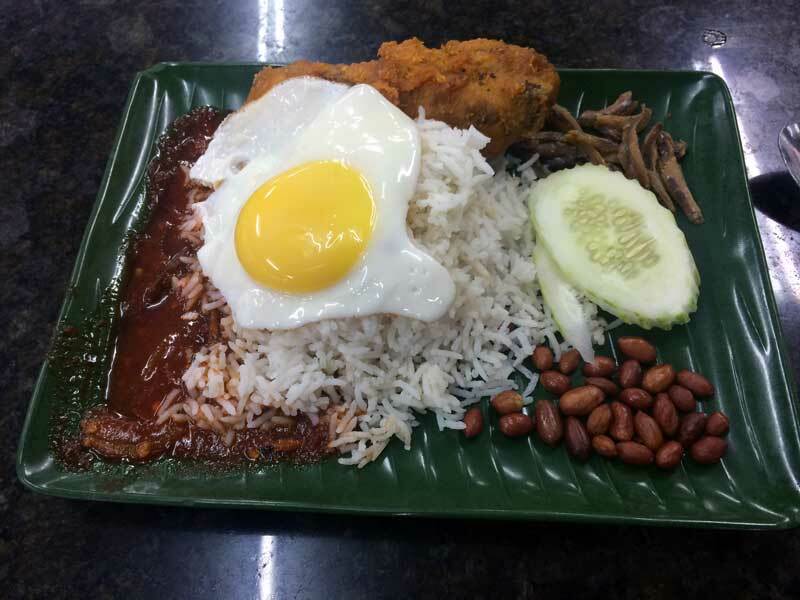 Nasi Lemak is considered purely a breakfast food by locals, so you'll never stumble upon it at night, and you'll get funny looks if you order it after noon. Nasi Kandar or Nasi Campur are blanket terms for a random assortment of meat and vegetable dishes with a heaping plate of rice. They're served cafeteria-style from a wide assortment of big metal trays filled with curries. Walk up, pick one or more of them, sit down and devour. 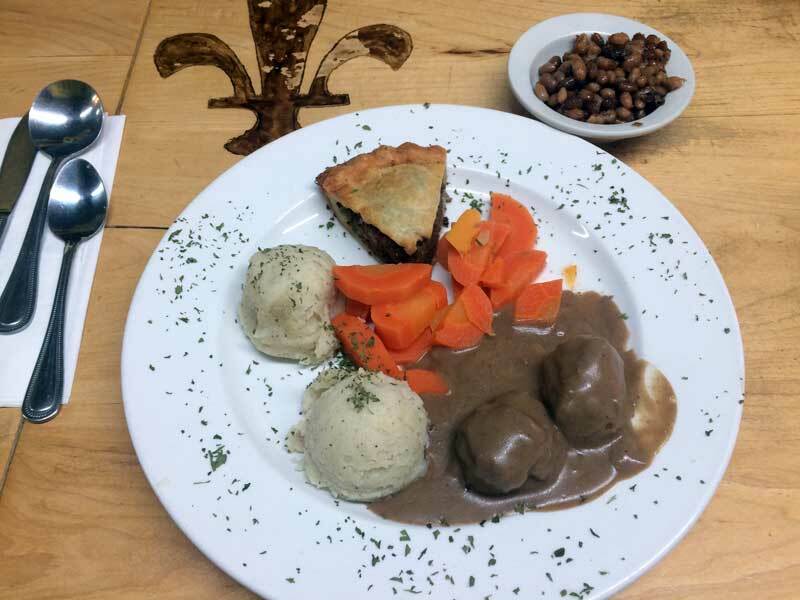 I found there was often dishes on offer that you would never actually be able to find on a menu somewhere, but you'll find amazing favourites like beef rendang (slow-cooked, spice beef), chicken curry, and more. I would highly suggest coming earlier in the day, and avoiding it completely at night, because well, it was probably cooked that morning and just been sitting in the 35 degree humid weather all day. 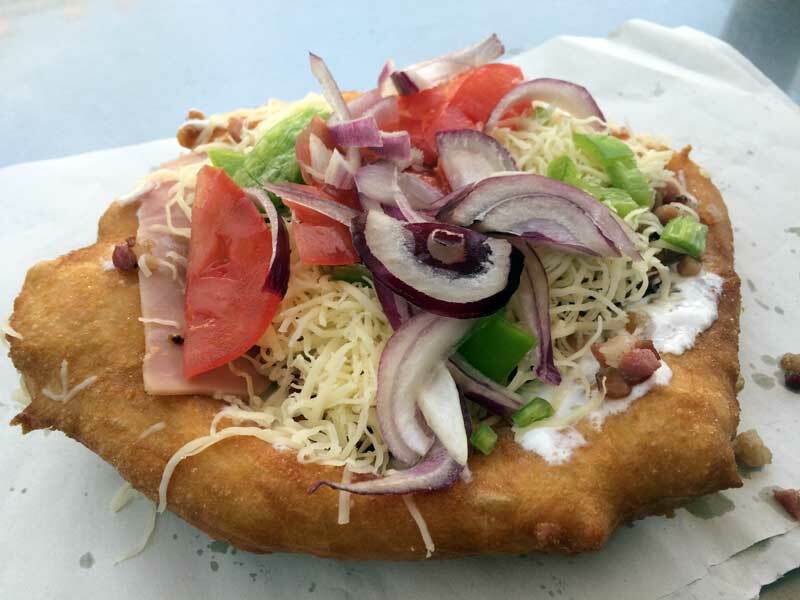 Get it at almost any of the restaurants, street food stalls, and even in the backs of trucks around lunch time. I have no personal favourite. 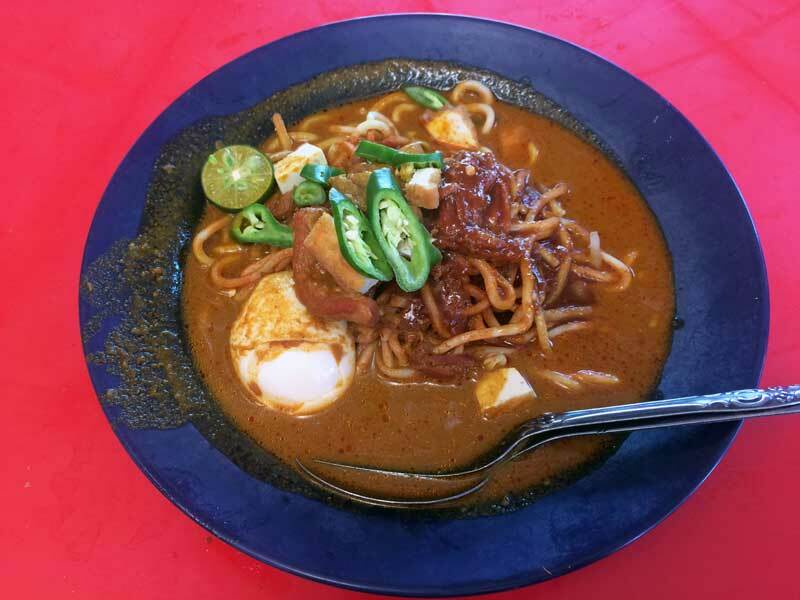 Mee Rebus is a uniquely Malaysian dish with Indian influences. Essentially a mixture of different noodles served in a spicy curry broth with pieces of egg, tofu, hot chilis, lime, seafood, and meat. The broth is rich, delicious, and guaranteed to add a bit of heat to your meal. It's a complex dish with a variety of ingredients that lead to a different flavour with each spoonful. The recommended go-to local spot was so hard to find that I didn't find it at all, so I resorted to a place near Central Market called Restoran Yusoof Dan Zakhir. Rojak is an interesting dish with a confusing mix of names. Wander around Malaysia and you'll wind up seeing all four of these names; Rojak, Fruit Rojak, Rojak Pasembur, and just Pasembur. The confusion comes from it being referred to by a different name in different regions. Essentially a rojak is a mixture of different things in a sweet, peanut-based sauce. 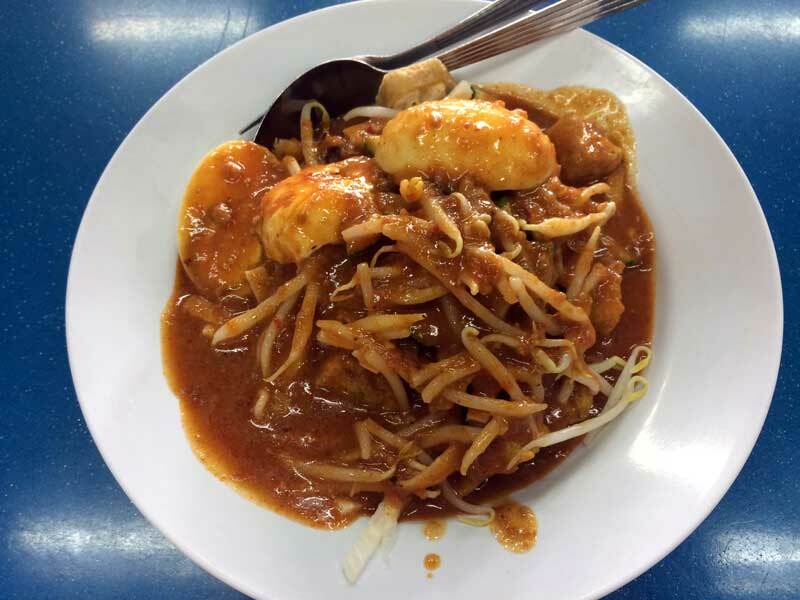 In Penang, the name rojak refers to a fruit salad doused in the sauce, but a rojak pasembur refers to a mixture of eggs, bean sprouts, and a wide variety of fried vegetarian delights like tofu, bread, and vegetable mixed together and doused in sauce. 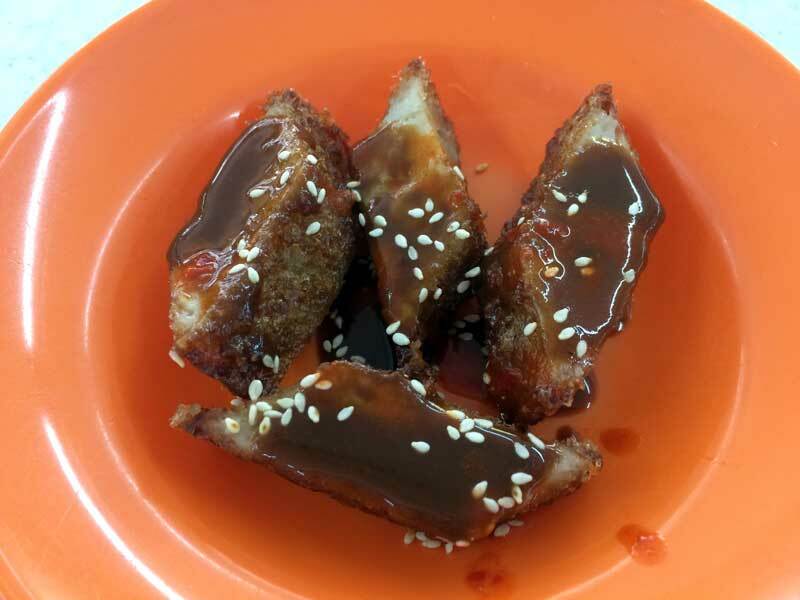 In KL, the term rojak generally refers to "rojak pasembur," and fruit rojak to "rojak." It's confusing, but whatever. I really enjoy rojak, particularly the pasembur variety, as it's a medley of savoury vegetarian dishes of varying textures (from smooth eggs to crunchy shelled tofu) in a tasty sauce. Another variation includes "mee rojak," which is the "pasembur" variety with a bed of noodles, just in case you weren't getting enough carbs. I personally stick to the normal version. I also got this at Yusoof Dan Zakhir and quite enjoyed it. 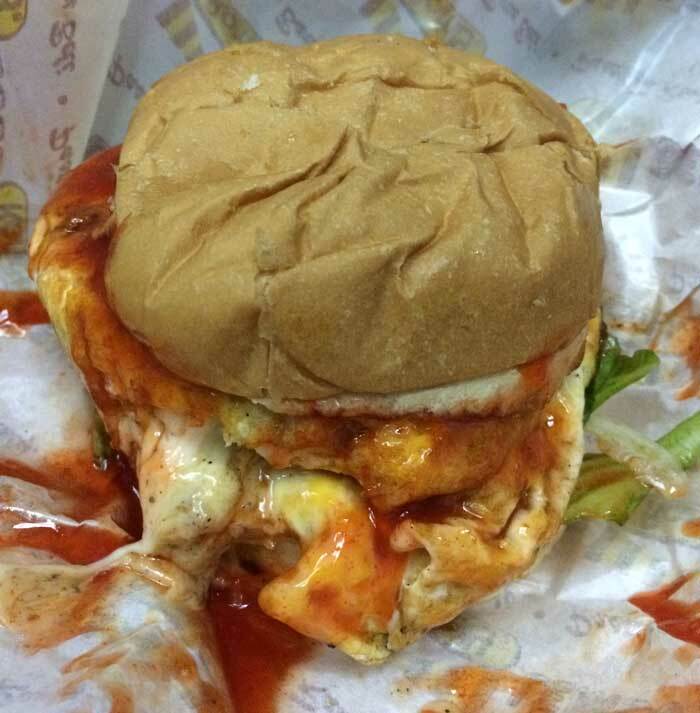 The Ramly burger is a KL street food classic. Ramly is the name of a brand of frozen burger patties that the street cart magicians us in the crafting of your late night street burger. They almost all have beef, chicken, fish, and egg (sometimes written benjo) burgers, and some even have shrimp and squid. As well as adding cheese, you can also double up on patties, and even go for the "special," where he wraps each pattie in an fried egg. Add some lettuce, onion, and serious quantities of mayo and sweet chili sauce and you have yourself one hell of a burger for $1-2. You can get it at various street corners near Chinatown, but the best I found was at the corner of Jalan Pudu and Sultan in front of the KK Supermarket. Both a Malay and a Chinese tradition are skewers of meat freshly grilled and served with a spice dipping sauce. 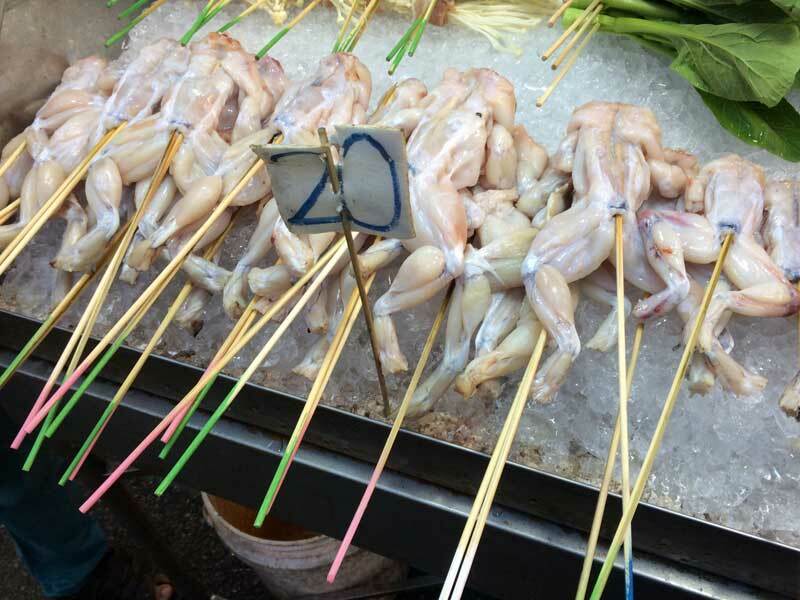 The Malay places generally just stick to hunks of chicken, pork, liver, and kidney, but the Chinese options get a lot crazier with frogs, squids, and many unidentifiable things. The Malay versions are generally about 1RM each, so grab a handful and enjoy. The Chinese ones vary in price an are colour coded to easily identify. Where: For Malay, there's one in front of Central Market, and for Chinese, both Jalan Sultan and Jalan Alor definitely offers the greatest selections. Popiah, or spring rolls, are hardly unique to Malayisa, but they certainly are delcious. 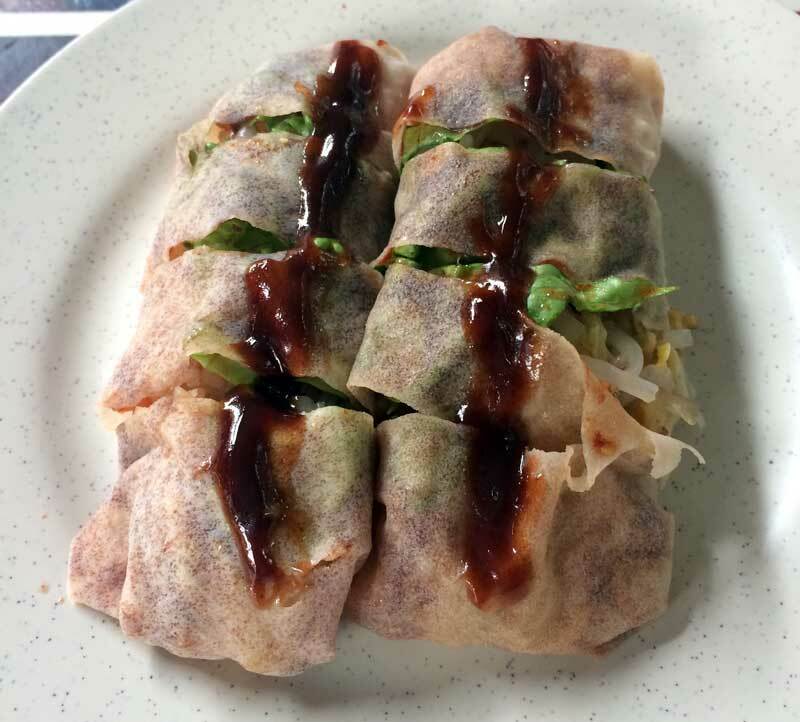 The typical popiah is fresh and not fried, is quite large, is filled with pork, sprouts, and other veg, and then dowsed in a mound of hoisinesque sauce. They're a perfect meal companion, or healthy mid-day snack. Generally they come in twos, or you pay per popiah. You can find them on Jalan Sultan, but I actually much preferred the vegetarian ones at Blue Boy. Malaysia is home to millions of people of Indian descent. Many of the local Indian families have been in Malaysia longer than they even have a historical record of when they came over. This means that the Indian cuisine is well established within the local cuisine and culture. Aside from the rotis, you can find amazing dosa (tosai in malay), uttapam, pongal, samosas, Indian desserts, and "vegetarian meals." Vegetarian meals are also known as thalis or banana leaf, a lunch-time tradition consisting of unlimited quantities of an array of vegetarian dishes served with rice and pappadams. They're traditionally eaten on either banana leaves, or a big metal dish called a thali (hence the names). These are also the places to haunt if you're on a tight budget (you can eat for less than 3RM), or if you're vegetarian or vegan. My favourite Indian place in KL is Bakti Woodlands Food Cafe, which serves practically absolutely everything. And it's all amazing. 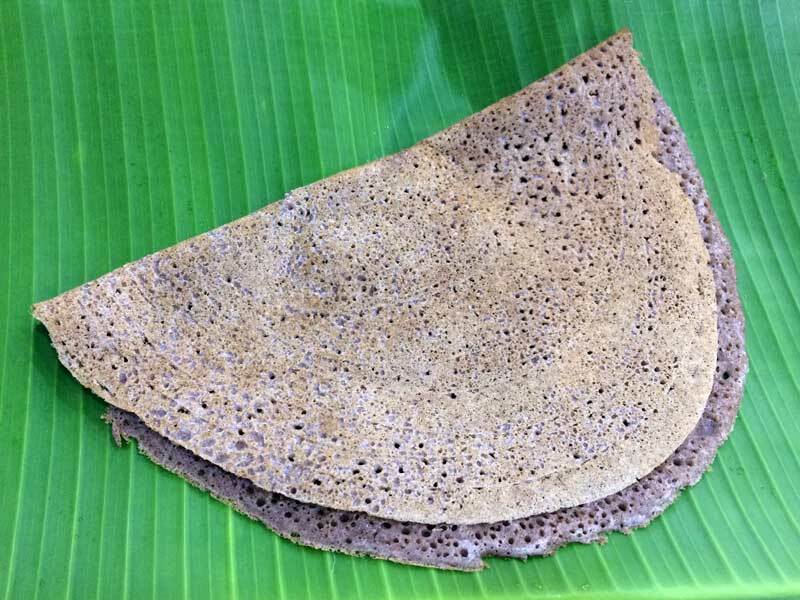 If you need help choosing a tosai, check out my other article The Dosas of India for a full breakdown of the varieties. The streets of KL are lined with fruit stalls, both in pre-cut and virgin forms. If you've never ripped open a mangosteen before and savoured the nectar of the Gods, I highly recommend doing so. Otherwise grab some of the notoriously bad smelling, but great tasting Durian, or the lesser intimidating jack fruit. Or grab a bag of pre-cut mango or watermelon with a sweet and spicy shaker on top. It's a nice healthy alternative to the constant fried fatty meats and carbs. Where: Nearly everywhere, but particularly the street corners around Chinatown, and Jalan Aloor. They disappear around the commercial center. If you're a vegetarian, have no fear, aside from the vast array of Indian joints, there is also an excellent vegetarian Nyona (chinese-malay) place to keep you fed and happy. 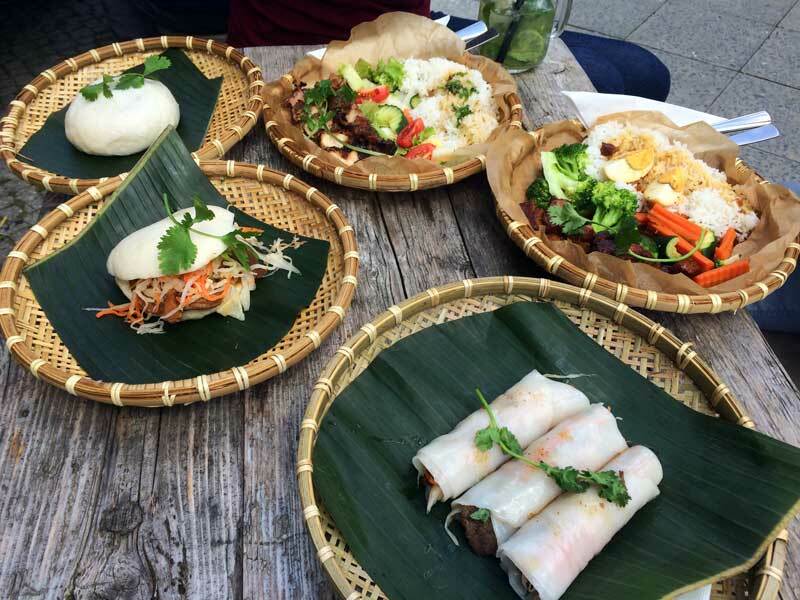 Blue Boy is a well-hidden street food market/restaurant where absolutely everything on offer is vegetarian. You'll be able to find delicious vegetarian interpretations of many of the dishes I've listed above, and more. I highly recommend the Yong Tao Foo, Curry mee, Popiah, and Lobak Kuih—a fried radish cake that is crunchy on the outside, and heavenly gooey on the inside. Sadly like many places in KL, however, it closes at around 5-6pm. So come for either a big lunch, or an early dinner. KL is more than the Petronas Towers and the Batu Caves. It's an absolute wonderment of culinary sensations, that I had an incredibly hard time summarizing into one article. 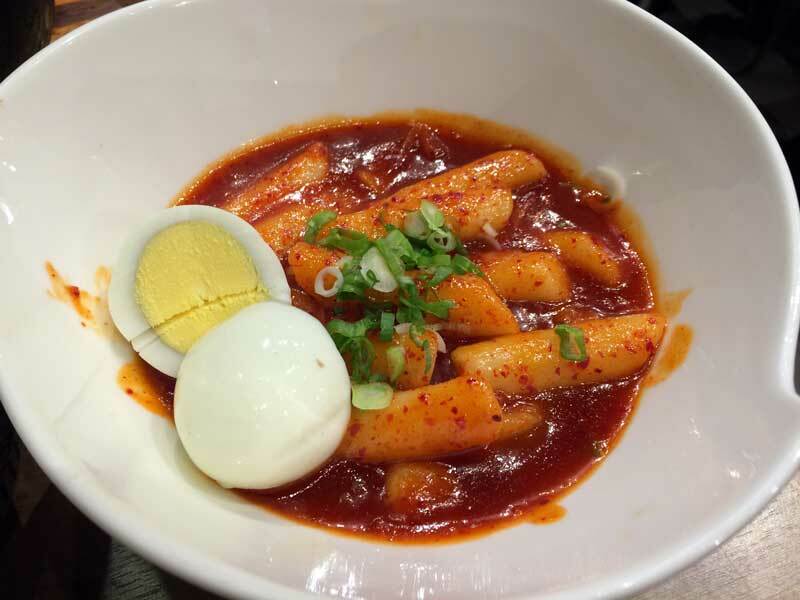 I didn't even begin to touch on the true diversity and expansiveness of the local cuisines on offer, and didn't even touch on the non-local options. If you have suggestions please let us all know in the comments below.